SAN FRANCISCO -- Anger, frustration and calls for action echoed around the NBA on Saturday after an audio recording surfaced of a man identified as Los Angeles Clippers owner Donald Sterling telling his girlfriend not to bring black people to games. Everybody except for the embattled Clippers owner, who has a decades-long history of discrimination and offensive behavior, seemed to have a response. The league said it was investigating the recording posted on TMZ's website, calling the comments "disturbing and offensive." Lakers Hall of Famer Magic Johnson, a target of Sterling's remarks, said he wouldn't attend Clippers' games as long as Sterling was the owner. Miami Heat star LeBron James asked new NBA Commissioner Adam Silver to take aggressive measures, saying "there is no room for Donald Sterling in our league." "Obviously, if the reports are true it's unacceptable in our league," James said. "It doesn't matter, white, black or Hispanic - all across the races it's unacceptable. As the commissioner of our league they have to make a stand. They have to be very aggressive with it. I don't know what it will be, but we can't have that in our league." Silver spoke Saturday night in Memphis, Tenn., before the Grizzlies' game against Oklahoma City, saying the league found the audio tape "disturbing and offensive" and that Sterling agreed to not attend the Clippers' game Sunday at Golden State. Silver said the NBA will move quickly in its investigation. "We do hope to have this wrapped up in the next few days," Silver said. "I think the biggest statement we can make as men, not as black men, as men, is to stick together and show how strong we are as a group," Rivers said. "Not splinter. Not walk. It's easy to protest. The protest will be in our play." Clippers President Andy Roeser said in a statement that the team did not know if the tape is legitimate or has been altered. He said the woman on the tape, identified by TMZ as V. Stiviano, "is the defendant in a lawsuit brought by the Sterling family alleging that she embezzled more than $1.8 million, who told Mr. Sterling that she would 'get even.'" Roeser also said the recording does not reflect Sterling's beliefs. He also said Sterling is "upset and apologizes for sentiments attributed to him" about Johnson, whom he called Sterling's friend. Sterling is scheduled to receive a lifetime achievement award from the Los Angeles branch of the NAACP next month. On Saturday, Alice Huffman, president of the NAACP California State Conference, said in a statement, "If these allegations are proven true, we are extremely disappointed in Mr. Sterling." Huffman urged the Los Angeles branch to withdraw Sterling's name from the honorees. In the recording posted on TMZ, the man questions his girlfriend's association with minorities. TMZ reported Stiviano, who is of black and Mexican descent, posted a picture of herself with Johnson on Instagram - which has since been removed. The man asked Stiviano not to broadcast her association with black people or bring black people to games. The man specifically mentioned Johnson on the recording, saying "don't bring him to my games, OK?" He also said the alleged comments are "a black eye for the NBA" and said he felt bad that friends such as Clippers coach Doc Rivers and Clippers point guard Chris Paul had to work for Sterling. Paul released a statement through the players union that said "this is a very serious issue which we will address aggressively." He also said Sacramento Mayor Kevin Johnson, a former NBA All-Star guard who is the chairman of a search committee to find a new director for the union, would take a leading role to help players address the matter. Paul and Clippers All-Star forward Blake Griffin declined further comment on the issue after the team's practice at the University of San Francisco. Other players were not made available as Rivers said he would speak for the team. "A lot of guys voiced their opinions. None of them were happy about it," Rivers said. "This was a situation where we're trying to go after something very important for us, something that we've all dreamed about all our childhoods. Donald or anyone else had nothing to do with that dream, and we're not going to let anything get in the way of those dreams." On TNT's halftime studio show Saturday, host Charles Barkley said: "This is the first test of Adam Silver. He's got to suspend him right now. First of all, they've got to prove that's his voice on that tape. But this is the first big test for Adam Silver. You can't have this guy making statements like that. You have to suspend him and fine him immediately." NBA TV analyst and former player Chris Webber said that "the NBA owners need to handle their own." A spokeswoman for the Rev. Al Sharpton's National Action Network, Jacky Johnson, said the organization planned a protest outside Game 5 of the Clippers-Warriors series Tuesday night in Los Angeles. "No one should be allowed to own a team if they have in fact engaged in this kind of racial language," Sharpton said in a statement to CBS News. In Dallas, where the Spurs were getting ready to play the Mavericks, San Antonio coach Gregg Popovich said: "The comments are obviously disgusting." Mavericks owner Mark Cuban said "I have plenty of opinions, just not going to share them," fending off several inquiries before saying: "Obviously, if any business or entrepreneur says or does things that aren't congruent with what the organization is trying to convey, that's a problem. But it's not my problem." Warriors coach Mark Jackson, who played for the Clippers in 1992-93, said of Sterling's comments: "My feeling would be the same, no matter if I was coaching, playing or a fan. There's no place for it." 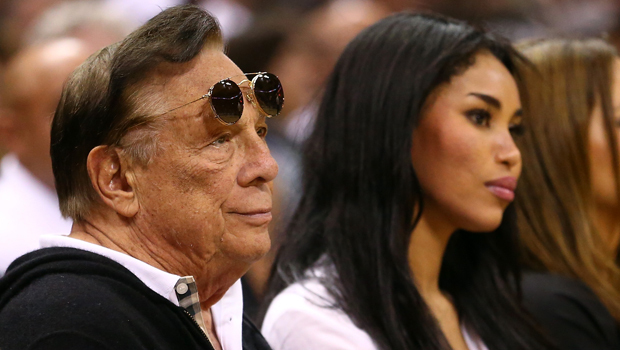 Sterling, a real estate owner, bought the Clippers in 1981. He is the longest-tenured owner in the NBA since Lakers owner Jerry Buss died last year. He has been frequently criticized for his frugal operation of the Clippers, although in recent years he has spent heavily to add stars such as Paul and Rivers, who is in his first year as coach. Sterling has been involved in several lawsuits over the years, including ones with accusations of discrimination. In March 2011, Sterling won a lawsuit against former Clippers general manager Elgin Baylor when a jury rejected the Hall of Famer's claim of age discrimination and harassment. Baylor, who was 76 at the time, had sought about $2 million after claiming he was forced out of the job he had held for 22 years. The team said Baylor left on his own and a jury awarded him nothing. Sterling is a courtside fixture at Clippers home games. But he rarely visits the team's locker room at Staples Center, although he made an appearance in December 2012 after they had won their 11th straight game, when he led an awkward locker room cheer.